Our speaker was Prof Don Pollacco from Warwick University who came to talk to us all about "Exoplanets". He introduced himself by saying that he is an amateur astronomer as well as working professionally in the field and was lucky enough to have met the Apollo astronauts Jim Lovell and Neil Armstrong. One particular observation that sticks in his memory is seeing the comet Hale-Bopp in early 1997 and its three tails. He explained that as it neared the Sun the heat caused more volatile material to be erupted from the comet's surface. One stream of material was gas, another was dust and the third consisted of sodium atoms. The dust tail roughly followed the actual orbit of the comet whereas the gas tail pointed directly away from the Sun and the sodium tail marked out a path between two. Prof Pollacco began his talk by saying that he was involved from the very beginning with the "WASP" project that looked for distant planets outside our Solar System (exoplanets) as they crossed their central star. The acronym stands for "Wide Angle Search for Planets" and the project began in 1999 whilst he was at Queen's University, Belfast. He built a prototype instrument called WASP0, which consisted of a Nikon wide-angle camera lens attached to a CCD camera. These were then mounted on a telescope in order to track the movement of the sky. WASP0 worked well on its two observing sessions, firstly on the island of La Palma and then at Kryoneri in Greece. With funding from Queen's University and PPARC he was able to upgrade the system to include more lenses and CCD cameras, allowing them to study more of the sky at once. The project now has two robotic observatories — SuperWASP-North on La Palma and SuperWASP-South near Sutherland in South Africa. 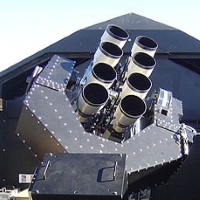 Each observatory consists of an array of eight Cannon 200 mm f1.8 camera lenses with a high quality CCD camera attached to each lens. Each observatory is housed in a large white shed-like structure with a roof that slides off automatically if the sky is clear enough. Both observatories spot exoplanets using what is known as the "transit method". For, when a planet crosses a star the light will dim with the fall in brightness being directly related to the size of the planet. So far they have spotted over 100 exoplanets, making it the most successful ground-based mission to date. Prof Pollacco said that there are a number of future missions that will be searching for exoplanets. NASA's TESS space telescope (Transiting Exoplanet Survey Satellite) launched on April 18th 2018 and will survey the whole sky for a period of 2 years. Further into the future ESA's PLATO spacecraft (Planetary Transits and Oscillations of stars) will not be launching until 2026 and its main aim is to find Earth-like planets.